The cost of paper is enormous in most companies. Anytime, you can find big pockets of paper usage, you generally have an opportunity to save your company thousands of dollars, if not millions. Paper and ink costs can be significant, but creating the paper is only a fraction of the cost of using paper. Handling, distribution, and storage costs are far bigger issues. Xerox research estimates each US worker creates 10-12 thousand sheets of paper a year. In the 1990’s, insurance companies used to pay our company $1.00 for each insurance claim we sent them electronically versus paper. In those days, insurance companies estimated the cost to process a single paper claim was $5.00. That’s creating $22,000,000 in cost every year. Not all of this cost is incurred by the company creating the paper, , , much of the cost is incurred by other companies who must handle, process, and store the paper created by our small company of just 100 employees. Think of the thousands of companies, with tens of thousands of workers and you can quickly see that the cost of paper and associated costs in handling, distributing, and storing it are enormous. With today’s technology, there is no reason we can’t reduce paper significantly. We won’t eliminate paper totally, but we certainly should be trying to reduce the creation of paper and the associated costs to our company. The challenge with clerical workers in most companies is the rate of turnover, , , they are the highest turnover group in your company which has additional cost implications such as recruiting, hiring, training, etc. Automating clerical processes allows you to just “not re-hire” as clerical employees leave your company. 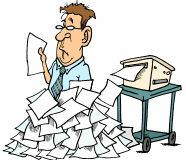 Document management systems – Implement systems that create and distribute electronic documents versus creating paper. Company policies on use of paper – Are you aware many employees print out most of their e-mail messages, , , and other things like it? Lots of opportunity in creating paper usage guidelines. Duplex printers – Printing on both sides of the paper saves a lot in the long run. Electronic Distribution Systems (EDS) – Data interfaces with companies you work with can eliminate boat loads of paper. Wal-Mart implemented a company-wide EDS program in the 1980’s that has saved their company billions, , , and continues to reduce the cost of their products to consumers. Use your Intranet – Stop producing paper for company information (newsletters, employee manuals, operations policies and procedures, etc.) and use your company Intranet to publish the information. Print to PDF’s versus paper – Most company documents can be printed to a PDF file and distributed, then selectively printed by the recipient as necessary. This will drive paper costs down quite a bit. Scanning and imaging systems – This technology is so much more cost effective than it was even 10 years ago. If you have large volumes of paper coming into your company from external sources, you can reduce costs a lot by scanning the documents and retrieving the images as needed to process and store the information. Make printing harder – Selective placement of printers within your company can actually reduce the amount of paper produced. 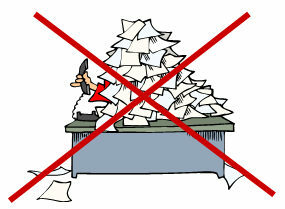 Automate clerical processes – Clerical workers are usually handling lots of paper. Automate the processes they do and eliminate the paper which allows you to eliminate the clerical worker position. Mandate change – To be effective in cutting the usage of paper, your company needs a “champion” who leads the way and encourages others in the company to look for innovative ways to reduce the use of paper. People do not change their ways easily, , , ultimately, senior management must get involved and reinforce the idea that change is required and you take it seriously. Most companies have excellent cost saving opportunities by eliminating paper. Take a day to tour your company and just look for large “pockets” of paper and think about what might be done to eliminate the creation of that paper, what costs would be eliminated if people did not have to touch it or if your company did not have to distribute it. You might be shocked at the cost savings opportunity !! This entry was posted in IT Manager Tips and tagged cost savings. Bookmark the permalink.